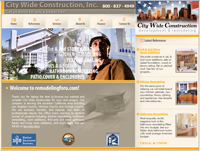 Citywide Construction is professional construction company with a decade of experience featured on TV show "Flip That House". IBCnet was hired to provide consulting, planning, custom development, programming services, host environment, internet marketing strategy, pay per click campaigns, and natural search engine optimization services. ".."IBCNet has consistently provided our company with complete satisfaction. All of our website hosting, custom programming, website design and SEO needs have been handled in an efficient and organized manner. I find IBCNet's customer service exceptional with complete contact availability, a depth of technical expertise, a solutions approach and fast turnaround on projects.." Read more."